Montessori is a method of education, developed by Dr. Maria Montessori, which is based on self-directed activity, hands-on learning, and collaborative play based on scientific observations of children from birth to adulthood. The goal of our program is to create learning environments that provide children the opportunities to learn using concrete connections and hands-on experiences. In this setting, we endeavor to motivate our students to reach their full potential by respecting their individual capabilities without placing pre-conceived limits on them. As a result, our students ascend, to greater heights academically, developmentally, and social-emotionally, and leave our program equipped to be personally successful and to make a difference in their communities. We also offer Before Care and After Care activities for children who arrive before the start of the class and those who remain with us after class. 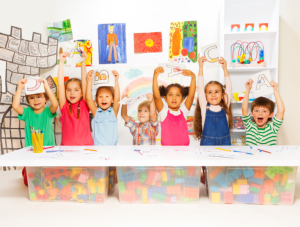 The activities conducted in the Before Care program are composed of free play and socialization; however, there is a structured curriculum prepared for the After Care program. *The children in our programs move up based on developmental readiness, not age/birth date. Learn more about our educational process. To speak with one of our trusted representatives, feel free to call us anytime at 210-558-3627. You can also Schedule a Tour to meet us personally and to check out our facility at your convenience. Feel free to contact us anytime using the details provided below.